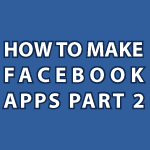 In the previous tutorial on How to Make Facebook Apps, I showed you how to get all of the tools you need and how to use a few XFBML tags. In this part of the tutorial, I’ll finish everything up. I’ll show you how the Facebook app we are building actually works outside of Facebook. You can see it here Facebook Movie App. I also show you how to grab YouTube thumbnails and how to dynamically load new videos. A Facebook app is just like any other web page. If you can program a way for them to enter their email, you can easily do this. Why don’t you just use the Facebook interface to get their email instead though? do you have any example I can use? An awesome tutorial, but I wonder how to publish the apps created…. your tutorial is very good and very helpful. how can i make it take all video from my channel automatically ? suppose i add new videos on my channels. with this code i nee to add the videos everytime I upload new video to my youtube channels. Can you make an updated video of what is going on nowadays on this theme for us who are not so “in” the Facebook programming? By the way, thank you for your answers at my e-mail. I’m sorry, but I have to go and investigate all of the changes made to Facebook. When I was starting this tutorial they changed a bunch of things and messed up the rest of what I was planning. That is why I ended the tutorial prematurely. I’ll see what I can do about answering your questions soon. Can i make an application for a user profile or it is absolutely required to make a Facebook Page and create the application for that Page? Also, can you tell me how can i get some announcements from a web page and put them to my NewsFeed after someone Likes my Facebook Page? I would like to make a fb app.i have little bit doubts on tmaking apps based on your method.Can you show me an simple video exampple to making an fb app.